Grooming your dogs can be a hassle, which is likely why most pet parents go to professional groomers. In order to have the easiest experience maintaining your dog’s coat, you’ll need the right tools. Finding the best dog brush will surely make grooming easier and more comfortable for your pets. As with any type of pet tool, you’ll want to make sure you’re investing your money wisely. The brush you choose should be made out of high-quality materials and offer years of use. Additionally, it should come with a comprehensive warranty. Above all else, the best grooming brush will be comfortable for your pets. It may take some trial and error; however, once you find their favorite one, it’s well worth it. Below, we have created a list of five different grooming brushes for you to consider. Each comes with its own array of benefits and features that are sure to improve your pet’s grooming experience. A self-cleaning pet brush seems too good to be true; however, this model is designed to be highly intuitive and user-friendly. The Hertzko Self-Cleaning Slicker Brush is a fantastic choice for all breeds. Though it’s highly recommended for dogs with medium to long hair, it could be comfortable for pets with short hair. Additionally, you can use it on your other pets as well, such as cats. The most important thing to note when using this brush is that as it has a bulkier design, you won’t want to use too much pressure. An excessive amount of pressure can be quite uncomfortable for your pets. Nearly every pet deals with matted hair, especially if you own an active dog. This brush is designed to get rid of deep mats without any pain. The fine bristles bend easily because they are crafted out of malleable wire. It also helps to penetrate the deepest levels of the coat for a thorough brush. The most notable feature of the Hertzko Self Cleaning Slicker Brush is that it’s self-cleaning. Once you’re finished grooming, you push a single button that retracts the bristles back into the brush. This then pushes the trapped hair, dirt, and dander off the brush. Aside from the fact that the bristles help to reach the deepest levels of their coats, the bristles also offer a skin massage. This helps to improve blood circulation through your dog’s skin. The healthier their blood circulation is, the shinier and thicker their coat will be. The handle of the Hertzko Self Cleaning Slicker Brush is also a fantastic feature. This is because it’s designed using comfortable rubber that gives you the best grip possible. Additionally, it’s intuitively anti-slip, so you’ll be able to maintain full control while grooming your dog. The Glendan Slicker Dog Brush is a slicker brush as well, similar to the Hertzko grooming tool. With that said, it also has a smaller profile which means it is easier to maneuver into hard-to-reach areas. If you’re looking for a basic dog brush, this is one of the better models to get your hands on. One of the things that we noticed at first glance is that the brush is available in two colors. You can choose between blue and pink to fit in with your other grooming tools. Additionally, because of its smaller brush head, it’s highly recommended for smaller dogs and cats. Not only does this slicker brush capture hair, but it also traps dander and dirt with every swipe. It’s also quite useful for removing mats, which can be one of the most difficult aspects of grooming. 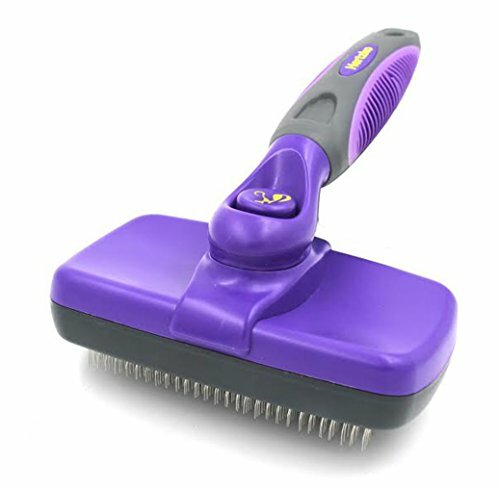 The bristles on the brush are specifically designed to give your pet a comfortable massage while brushing. With the massage, you’ll be improving the skin’s blood circulation which promotes a healthier and shinier coat. The handle of the Glendan Slicker Dog Brush is important to take note of as well. It features an anti-slip grip that is comfortable to hold for long periods. This helps to give you the maneuverability you need while getting into hard-to-reach areas. Another interesting feature of this dog brush is that it has a fully rotatable head. As you brush through your pet’s hair, the brush head can rotate up to 360-degrees. This makes it much easier to get to difficult areas of your pet’s body. It’s important to find a pet brush that comes with a warranty. As it’s a tool that you’ll be using on a regular basis, you’ll want to make sure it lasts a long time. The Glendan Slicker Dog Brush comes with a 90-day money-back guarantee, without any questions. It also comes with a 365-day quality guarantee. In the event that the brush breaks within its first year, you will be able to receive a replacement at no cost. At first glance, the barkOutfitters Slicker Brush looks like it’s designed for cats. However, it is also incredibly useful for small dogs. 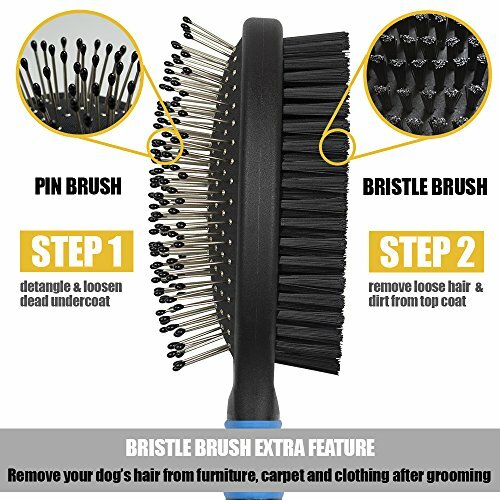 You’ll also love this brush for getting into the smaller areas of your dog’s coat. It’s designed specifically for ease of use but to also keep your pets comfortable while grooming. It also has one of the smallest builds out of the other best dog brush models on this list. 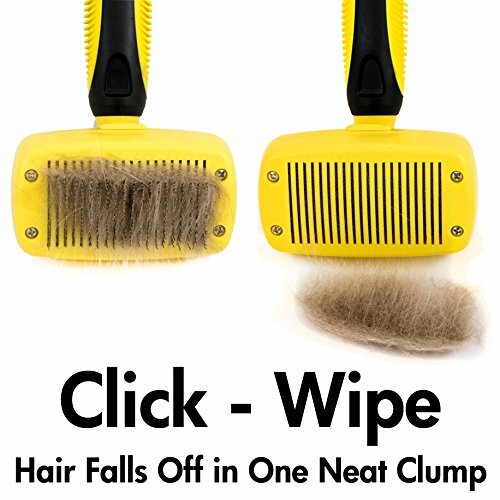 If you have a particularly anxious pet, this may not be the ideal brush for you. Some pets may be intimidated by the bright yellow color of the brush. However, as the brush operates incredibly well, it could be worth trying. According to barkOutfitters, this grooming brush is designed to reduce the amount of hair your pets will shed by up to 90%. This provides long-term benefits as well as being able to remove any excess fur from their bodies. Additionally, the less fur they shed, the fewer airborne allergens there are in your home. The bristles built into the barkOutfitters Slicker Brush are designed to help stimulate your pet’s skin, whether it’s a cat or a dog. This type of stimulation helps to create a healthier and shinier coat after a couple of uses. With each brush, you’ll not only be promoting healthier blood circulation but the healthier distribution of oils as well. Apart from the stimulating benefits, the bristles are specially designed to be incredibly comfortable. The barkOutfitters Slicker Brush is one of the few slicker brushes that works perfectly on short to long haired pets. According to barkOutfitters, the grip on this slicker brush is entirely unbreakable, which means it’s designed to last through years of use. The handle is also ergonomically designed to prevent wrist and hand strain. 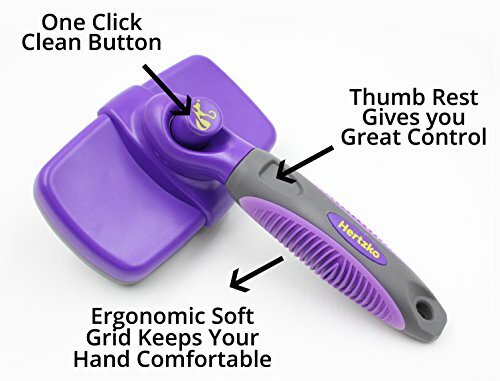 As another ergonomic feature that makes the brush more comfortable, there is a thumb rest built into the handle. As you hold the handle, your thumb will have a natural notch where it can rest. This feature also helps to improve the amount of control you have while grooming your best. The Fur-Ejector is one of our favorite features, as it helps you to clean the brush with ease. Once you have finished brushing your pet’s coat, you can click a button to retract the bristles. Any hair, dander, or dirt on the brush will immediately fall off. As another feature that speaks to the durability of the brush, it features stainless steel bristles. These bristles are incredibly comfortable for pets but also help to make sure the brush lasts a long time. With each purchase, the manufacturer will help a designated pet shelter. One dollar from each purchase goes to no-kill shelters to assist abandoned animals in being adopted. Out of all of the other grooming brushes on this list, the barkOutfitters Slicker Brush has the best warranty. The product is fully covered by a five-year guarantee. If at any point within the first five years you are dissatisfied, you can get a full refund. Alternatively, you can request a new brush as well if you receive a faulty item. It’s well-known that most pet brushes can be used with both dogs and cats. However, this model is more unique than most because of its appearance. The BV Dog and Cat Brush is built with two separate brushing sides, depending on the type of fur your pets have. Additionally, each side offers its own advantages for working out different types of dirt and matted hair. The bristle side of the brush is the first step of the grooming process. You’ll use this side to work out tangles and dirt. Additionally, it’s quite useful for capturing any loose hair. It looks similar to a traditional hairbrush. On the opposite side of the brush, you’re faced with round-tipped bristles. Once you have finished using the regular bristle end, you can then use this side. It is specifically designed to help remove any excess hair that the regular bristles missed. It’s also a fantastic way to help distribute natural oils through your pet’s coat. This helps them to grow a healthier and shinier coat. 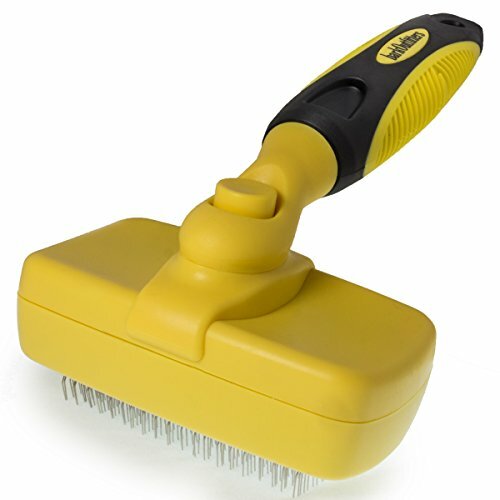 The handle on the BV Dog and Cat Brush is quite comfortable to use for long periods of time. It has a grooved grip that will sit comfortably in your hand. It also helps to give you better support and control when working with pets who typically don’t like grooming. Each bristle is built into ventilation holes throughout the brush. These holes are designed to help the bristles move naturally. As you brush your pet, the bristles will gently move against their skin. They also easily adapt to the contours of their body to get into hard-to-reach areas. In terms of its warranty, this particular brush isn’t covered for as long as other models. You will receive a limited one-year warranty on your purchase. This usually covers manufacturing defects. However, you may be able to contact customer service for a refund if you are not 100% satisfied with your purchase. When it comes to pet grooming tools, one of the largest companies is easily FURminator. In fact, plenty of pet parents find themselves comparing everything to FURminator brushes. With that said, the FURminator Firm Grooming Slicker Brush is easily one of the best brushes on the market. It’s also important to note that it’s one of the more expensive brushes you can find depending on the size you need. This brush is available in both small and large, which helps you to find the perfect model for your pet. As with most other FURminator brushes, this model is recommended to be used along with other tools for a full grooming experience. The Firm Grooming Slicker Brush is the first step in a three-step process. For thicker coats, you may want to consider investing in a rake brush as well. One of the most notable features of this brush is that it’s specifically designed to prevent hair pulling. Often times, while grooming, you could be pulling on your pet’s hair which is quite painful. With a high-quality brush, you can ensure that it will glide through their coat easily. This particular model removes mats and tangles without excessive pulling. The intuitive design of the FURminator Firm Grooming Slicker Brush makes grooming more comfortable for your pets. 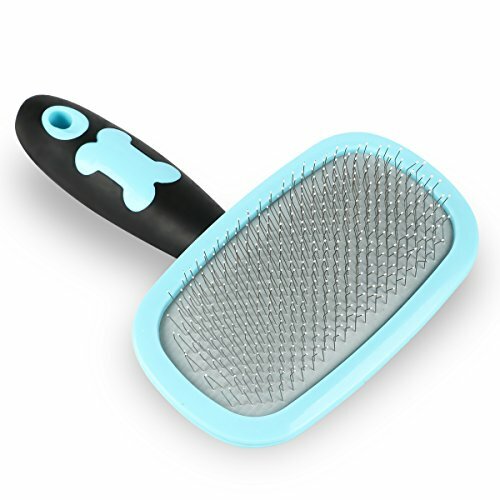 This brush is specifically designed to reduce the amount of pressure on your pet’s skin. You’ll find they’ll be more open to being groomed because of how comfortable it is. 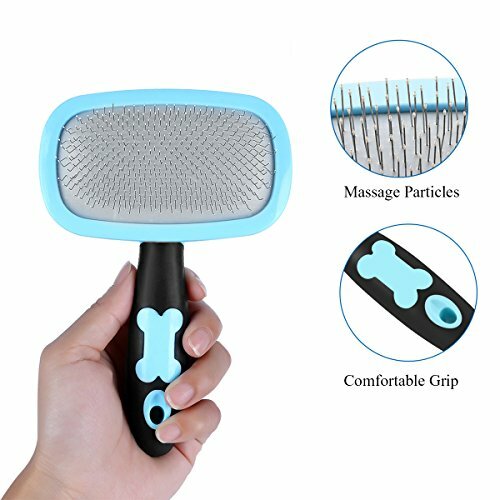 This entire slicker brush is quite ergonomic and easy to use, which is ideal for pet owners suffering from arthritis or joint pain. The handle is comfortable to hold for long periods and gives you the control you need. 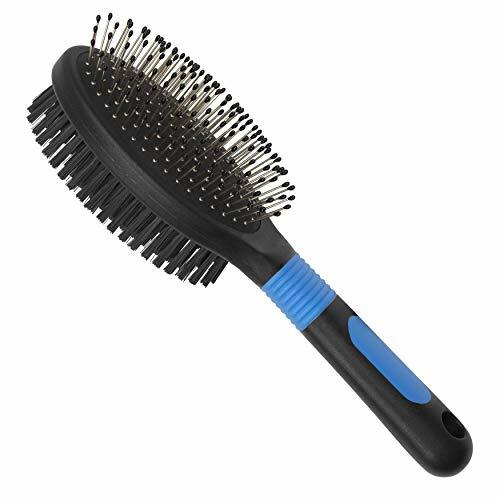 To help mold to the contours of your pet’s body, the brush head is entirely flexible. This helps to limit the amount of motion your wrists deal with. Additionally, it makes it easier to get to hard-to-reach areas of your pet’s body. We all know how dirty pets can get. After grooming, the last thing you’ll want to do is thoroughly clean your grooming equipment. Luckily, the FURminator Firm Grooming Slicker Brush is anti-microbial. It prevents bacteria from building up in the bristles after you work dirt out of your pet’s coat. However, it’s still recommended that you deep clean the brush occasionally. On one half of the brush, the bristles are bent, and on the other side, they are straight. This helps the brush to work through all different types of hair with ease. This design also keeps the bristles in their optimal position for deeper brushing. If you’re heading out on a trip or leaving your dog with a family member, you’ll love the included protective cover. It helps to keep the metal bristles in their pristine condition. There are plenty of different brushes you can find from FURminator. However, this model is specifically meant for dogs with long, medium, and curly coats. It won’t be as effective with shorter coats. There are several things to take into consideration when it comes to choosing the best dog brush for your pets. You’ll want to make sure you find an affordable brush, one that is comfortable for your pets, and a design that is comfortable for you as well. Further, it’s also important to take longevity into account, as grooming tools can be quite costly. On that note, you will want to find a grooming brush that comes with a warranty. There are two brushes that we would recommend you to consider. 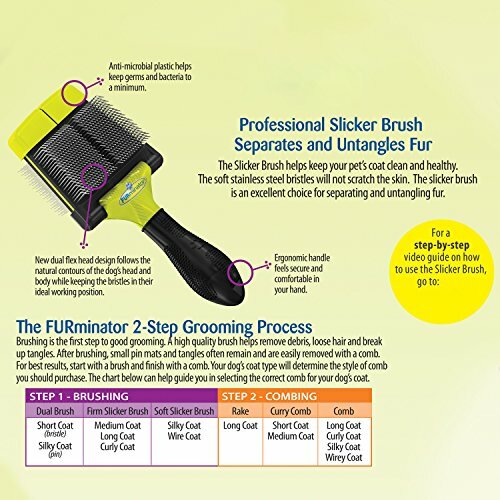 For pets with medium to long coats, the FURminator Firm Grooming Slicker Brush is the best option. It has the most useful features when compared to the other brushes we’ve examined. Additionally, the FURminator Firm Grooming Slicker Brush is specifically designed for the comfort of your pet. The main issue to consider is that it’s not built as durable as other models, but it is certainly worth using. The FURminator Firm Grooming Slicker Brush is designed to be anti-microbial which protects the health of your dog. The less often that bacterium builds up on the brush, the less often you’ll need to clean it. Additionally, you’ll find that grooming will be much quicker with less cleanup. 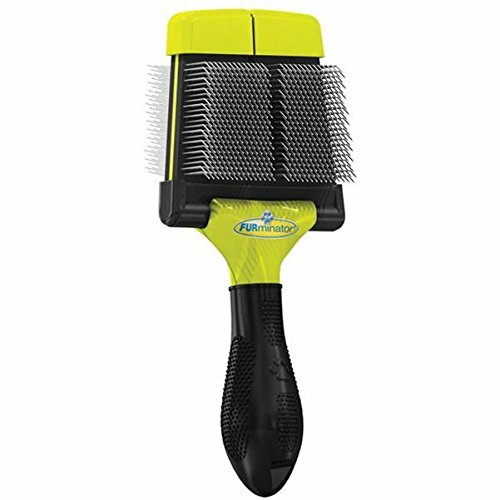 Another thing that we loved about the slicker is that the brush head moves with the contours of your pet’s body. It can be quite frustrating to try to work your way into contours with a brush that won’t maneuver. You’ll also find that this helps to make it more comfortable to use for long periods. Finally, the comfort of your pet is very important. You’ll be pleased to learn that the FURminator Firm Grooming Slicker Brush prevents hair pulling. It is also known to glide through mats and tangles for a more enjoyable experience. Not to mention it’s designed to prevent an excessive amount of pressure on your pet’s skin.